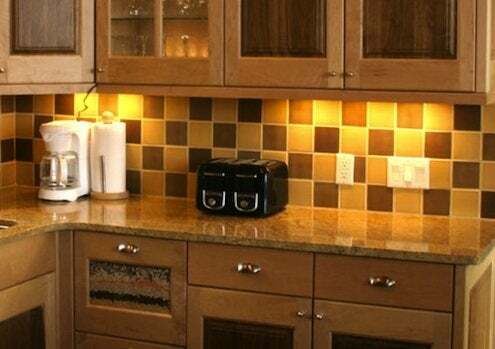 Under-cabinet lighting can vastly improve the workability and appearance of your kitchen. For starters, under-cabinet lighting facilitates cooking tasks, such as chopping veggies or reading from a recipe book. Aesthetically, it helps balance the room’s ambient light, eliminating shadows in parts of the kitchen that would otherwise be dark. 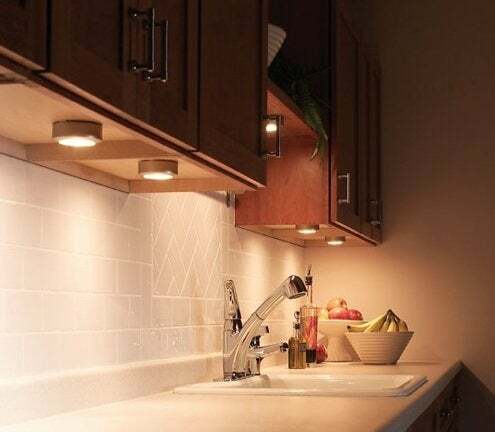 An added convenience is that under-cabinet lighting can serve as a nightlight if equipped with a dimmer. A plug-in fixture may be used for short runs of under-cabinet lighting, but for an entire kitchen, hardwired fixtures are the best option. For the latter, you’ll need a code-compliant source of electricity that is not already dedicated to the refrigerator or counter appliances. Avoid any circuit at risk of becoming overloaded. You may be able to run the circuit from a junction box in the basement or an adjacent room, assuming you have the requisite knowledge and experience to work safely with electricity. Don’t know what you’re doing? Hire a licensed electrician to run a new line from the electrical panel. The new junction box for your under-cabinet lighting can be located behind cabinetry or in a nearby wall. Cables for the fixtures will be run inside the wall; if run through your cabinets, the cables will be metal-clad. When mounting any fixture under a cabinet, position it to the front. If there is a lens, face it toward the backsplash. The bottom-front rail of the cabinet should hide the fixture from your line of sight, whether you’re standing or seated. If it doesn’t, consider extending the rail with a narrow board or trim piece. Operating on either low voltage or 120-V, under-cabinet fixtures may be classified by form (spot, bar, strip, tape, etc.) or by light source (incandescent, fluorescent, or LED). Spot and bar fixtures may be incandescent, fluorescent, or LED; strip and tape fixtures use LEDs. • Spots, also known as puck lights, create pools of light that if spaced too far apart, may leave some areas in the dark. Bars, assuming you mount them end to end, will provide even light along the counter. • Because they’re so narrow (less than an inch), LED fixtures are easy to hide. Their impressive length also appeals; while strips and bars are available in three-foot lengths, LED tapes are available in lengths up to 16 feet and can be cut to fit your installation. • Incandescent under-cabinet lights are typically equipped with either halogen or xenon bulbs. Halogen bulbs are more expensive, emit more heat, and use more energy than other sources, but they produce a nice light and are dimmable. Xenon bulbs give off less heat and are more efficient, plus they last longer. • Fluorescent under-cabinet lights are cool to the touch and efficient. Newer fluorescents neither hum nor flutter, and the light they produce is warmer than that of earlier incarnations. The bulbs are inexpensive to buy and use very little electricity, and when they burn out, it’s easy to replace them. Many fluorescent fixtures, however, cannot be put on a dimmer switch. • LED lights last the longest—10 to 20 years or more—although their output fades over time. And when an LED bulb goes out (or breaks), the entire fixture must be replaced. • If you opt for LED, choose a warm-light fixture, not a harsh, bright white one. Also, bear in mind that the number of lumens produced by LED fixtures tends to vary. Though LEDs have a higher purchase price than either incandescents or fluorescents, the technology’s energy efficiency keeps down long-term costs.